With more than 20 years of experience in waterproofing, roofing repair and maintenance, Proof-Tech Waterproofing & Maintenance Pte Ltd has worked its way up to be the top and leading specialist contractor in Singapore. With projects ranging from commercial to private landed properties, Proof-Tech is popularly known for its low price, affordable, cost effective yet high quality workmanship. Having more than 180 experienced professionals working round the clock, be it our sales team, customer service officers or operation staff, our response time to our respected clients is almost immediate. At Proof-Tech, it is our policy to offer materials of the highest quality, durability and overall performance. We do not compromise on these as we believe in developing strong and lasting relationships with all our clients. We cater to clients’ needs not with just one type of application but tailormade according to their expectations. With our professionalism and technical know-how, Proof-Tech has earned its reputation as a reliable and trusted partner both in the commercial, residential and landed properties’ market. Finding different contractors for different water leakage, waterproofing, repainting, restoration, concrete, cement repair, and the list goes on. We provide total solutions with confidence. We are not a general contractor who does general common works. 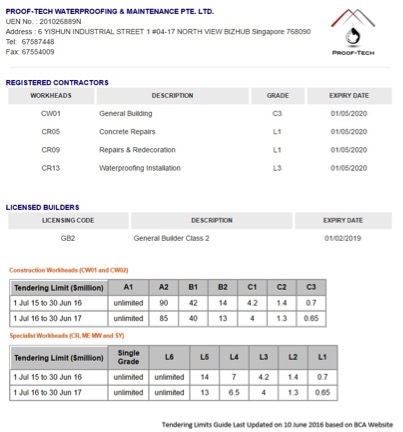 Proof-Tech is a Registered Contractor, with the Building and Construction Authority of Singapore (BCA), registered with Specialist Workheads for Concrete Repairs (CR05). Repairs & Redecoration (CR09) and Waterproofing Installation (CR13). We are also a Registered Contractor for General Building (CW01) which means we are also well equipped with general construction and building repair works. Unexperienced contractors who do not understand your needs will allow problems to be unsolved or persists shortly after repair. Water ponding is the leading cause for corrosion and weakening of the roof. With that, water and air start to penetrate through the pores thus causing water leakage. Customers and clients can rest assure that Proof-Tech uses only good quality and durable materials. Coupled together with highest quality workmanship and professional, proper installation of waterproofing techniques. We are committed to providing all our customers and clients with resources to support compliance and execution of our company’s integrity. Our prices with the high-quality workmanship are popularly sought after by the government, commercial and private residential market. We are transparent in our businesses and deliver what we promise in our tenders and quotations (see Why Us, Our Integrity).